Hot on the tail of quartet rehearsal on Wednesday night, and despite the forecast snow, we had an EphenStephen rehearsal last night in preparation for our upcoming 4th concert in this year’s series. The concert will be in August & will feature music from the British Isles, including pieces by Lawes, Dowland, Renbourn, Glyn, Lennon/McCartney and Mercury… S1 was on the customary spruce/rosewood Howell & I thought that it’d be a nice outing for the 1968 Kohno. Along with the Lagavulin & Twinings (not Yorkshire, unfortunately! ), we reckon that’s not bad company for an evening. 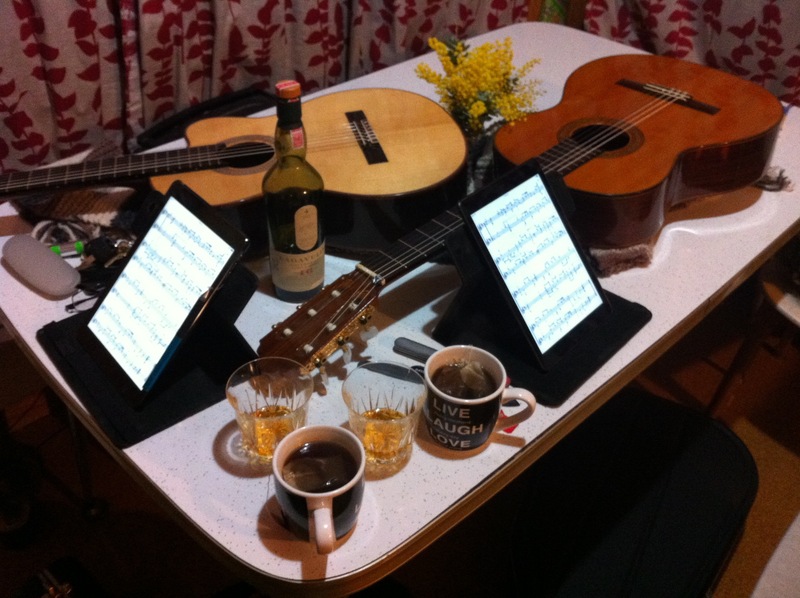 Anyone who can pick the composer & piece displayed on the iPads gets free entry to the concert. Comments below please! If you’d like to be on the concert mailing list, just send us an email or message through Facebook and we’ll keep you posted about concert dates & upcoming events that we’re involved in. Our programme will include Bach, Scarlatti, Tommis, Cruz and York. Sunday 30th August at 12.30pm in the Armidale Uniting Church. Put it in your diaries! We’re not quite sure what the theme ended up being, but all the pieces seemed to want to fall together as a programme as we were choosing them. Definitely music for the imagination… Any more specific suggestions of thematic content welcome below in the comments! In S2’s wisdom, whisky was offered to the late night audience. And while this may have increased attendance, we’re still not sure if that was snoring we heard from the back row… Thanks to Tony from Black Dot Music for taking some footage (below) of the 11pm concert. Last night we read through a few kilograms of music and we think we have a nice selection for our next concert on April 12. Oddly for us, it will be a programme of all Latin music! Thanks to everyone who came to our last concert of Bach, Rameau, Johnson and Bacheler. It was a heavy concert, like a strong single malt, our next concert promises to be a light Sangria. This year, we’ve decided to do a 6 concert series, featuring not only repertoire that we’ve enjoyed playing over the years, but also as an opportunity to try out some new things. We gave the first concert of the series yesterday, Feb 1st in Kez’s studio (thanks Kez! ), and featured music by Bacheler, Johnson, Bach and Rameau. Had great fun. Programme below! It’s been a while since our last posting – that doesn’t mean that we haven’t been busy! One of us was overseas for a while, then we started transcribing Rameau’s Suite in A minor (1728) to perform at the upcoming New England Bach Festival. We transcribed the whole thing 3 times – 3rd time lucky! 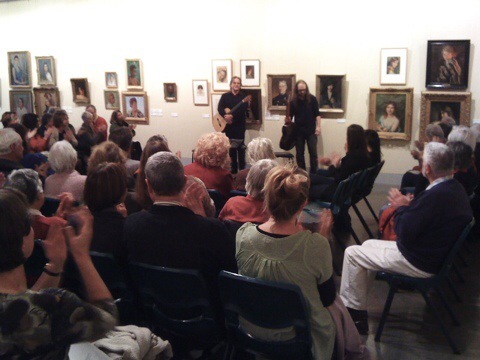 Got to perform it today at NERAM to a packed house and enthusiastic reception. Phew! Mr Tafra (S1) played Mr Thorneycroft’s spruce 2008 Richard Howell guitar and Mr Thorneycroft (S2) played a 1976 8 string Ramirez 1a, kindly on loan from the estate of Dr. Vic Bofinger. The act of transcribing harpsichord repertoire for the guitar is not an uncommon practice, however the art of transcribing harpsichord repertoire for the guitar, and indeed two guitars, is a somewhat different matter. The translating of notes from plucked strings to plucked strings with the occasional octave transposition is straightforward enough, but to translate resonances, registral alignment, clarity of voice, colouristic potential etc into music that is not so much ‘idiomatic’ but respectful in all perspectives, requires a thoughtful as well as creative hand. The idea of transcription is not simply to reproduce the original notes through the new instrumentation, nor is it to rewrite them in order to (re)create the music as if originally intended for the new instrumentation, but is rather to strike balance by acting act as a kind of curator, taking into consideration historically informed performance practices, motific ideas and phrase structures embedded in the music, colouristic potential etc, as well as the personalities and backgrouds (or indeed, baggage!) of the transcriber(s), performers and instrumentation. Moreover, the translating of music originally intended to be handled by one player on one instrument into music that is handled by two people on two instruments, but acting as a single ensemble, demands careful consideration. A curator enables the opportunity of weaving an assemblage of what may be seemingly unrelated artwork around a unique thread generated by a set of values, history and circumstances, treading a path through the wealth of available media and creative possibilities which may simply be found as ‘interesting’. 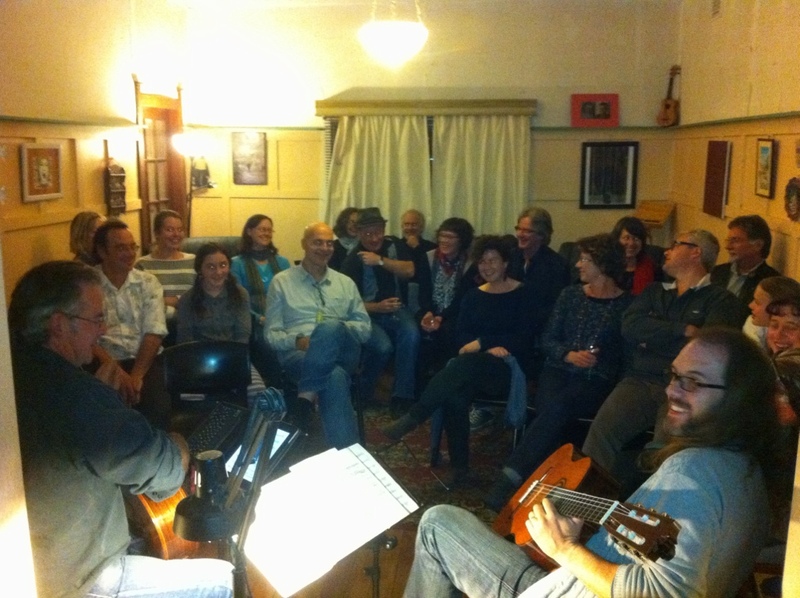 House concert and curry last night at the Tafra’s. Good thing that floor held up! Our quartet ‘Totally Plucked’ is giving a house concert tonight. Music by Tommis, York, Goss and of course Kraftwerk. Thanks Kez for hosting the gig!